London Marathon 2013 and Emily Pearce's Story | Life, Sport and Diabetes - An everyday look at my life with type 1 diabetes. 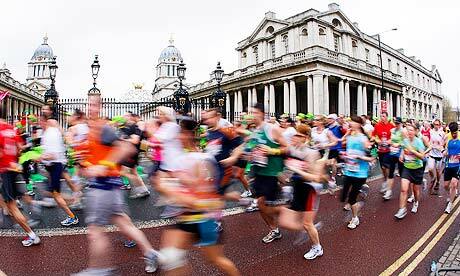 Every year tens of thousands of people compete in the London Marathon. Through blood sweat and tears and often gruelling training regimes they prepare all year to compete for fun, for themselves and for charities. For the London Marathon 2013 it is estimated that over 36,000 people will be taking part including Olympians, Paralympians and other well known famous faces. But this year amongst the other fantastic causes that are being supported, there are 15 people that are doing it for a memory and a story that will touch your heart. These 15 runners are known collectively as 'Team Em' and are running in memory of a young woman called Emily Pearce, who had Type 1 diabetes. Sadly Emily passed away in her sleep at Easter time last year. Emily was just 29 years old and had had the condition for the last 10 years, but that terrible night she had a dramatic hypo that contributed to her passing. In previous years Emily was an avid fundraiser for Diabetes UK, raising funds and awareness through events such as sponsored runs. She had even secured a place in this years London marathon. It was Emily's inspirational fundraising that inspired her family and friends to form 'Team Em' to run in this years London marathon. 'Team Em' were hoping to raise a total £26,200 for Diabetes UK by running the marathon, and through generous donations had already raised £5,000 at Emily's funeral. Today's marathon hasn't finished yet, and already the phenomenal team including her sister and partner have raised £32,234.65. An astounding amount that will go very far towards supporting people with diabetes, research towards a cure and treatment and also raising awareness of the condition. It is in total thanks that because of inspirational people like 'Team Em' and Emily herself, that people with the condition can look forward to a brighter future. I'm sure that in the future her memory will live on, by all the people that have been touched by her story. A full article on 'Dead in Bed Syndrome' can be found on the Diabetes UK page.